A former elementary school teacher and author of The History of St. Francis College, Esther Healy has demonstrated an extraordinary devotion to local history during her 31 years as archivist with the Richmond County Historical Society. She was awarded the 2009 Marion Phelps Award in recognition of her outstanding contributions to the preservation of Anglophone heritage in Quebec. 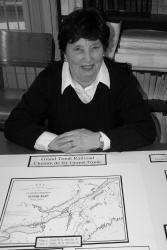 Mrs. Healy has helped innumerable seekers of their family history from all over North America and beyond. She has also routinely taken on the task of finding and saving many historical documents that might otherwise have been lost and has been chiefly responsible for securing funding to hire students each summer to work at the Richmond County Historical Museum. Thanks to her volunteer commitment, the history of Richmond County has been well preserved for future generations. Mrs. Healy’s many accomplishments include the implementation of a new archives centre, the restoration and management of the historical society museum and numerous fundraising activities essential to survival of the Society. Over the years, Mrs. Healy has taken on the responsibility for the archives pertinent to the English, Scottish and Irish heritage of Richmond County and vicinity and has overseen research and documentation of Anglophone one-room schools, railroads, local military history and numerous museum exhibits.